Looking forward to showing much more details of Cardpocalypse in future! We are looking to hire two people to work on our next game: a Game Designer and a Writer. This is a chance to join the award winning games studio Gambrinous as we embark on our second game making adventure. Guild of Dungeoneering – we want your feedback! 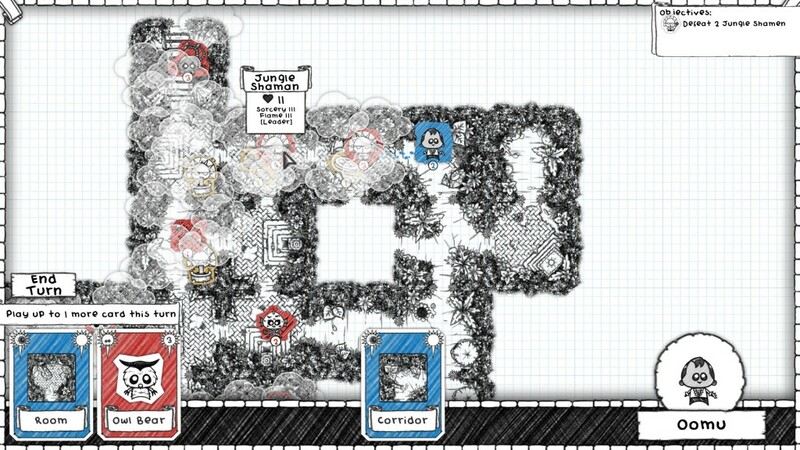 Here at Gambrinous we'd love to hear from you if you have any feedback about Guild of Dungeoneering! 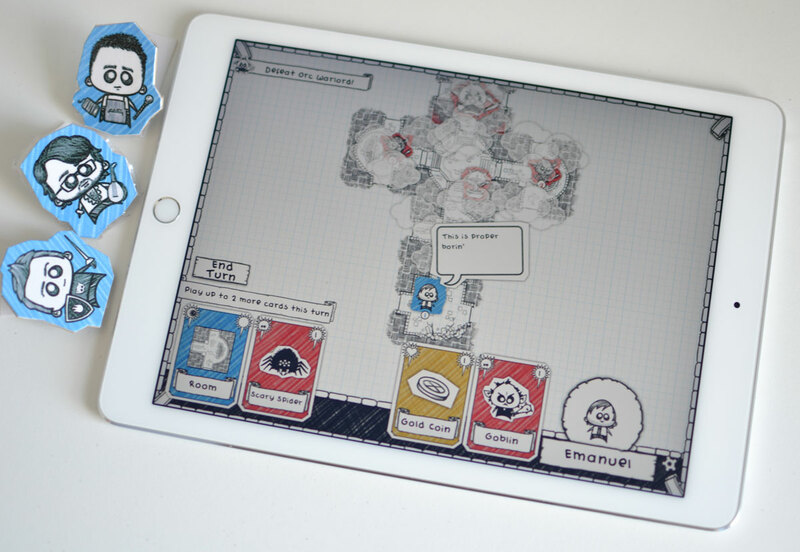 Guild of Dungeoneering coming to your phone and tablet! 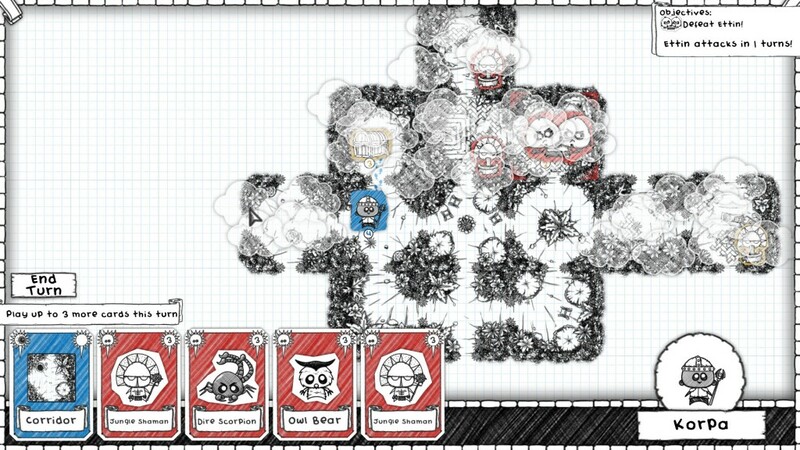 Here at Gambrinous we've been busy creating the mobile version of Guild of Dungeoneering for the last age. The good news is that it's almost ready! 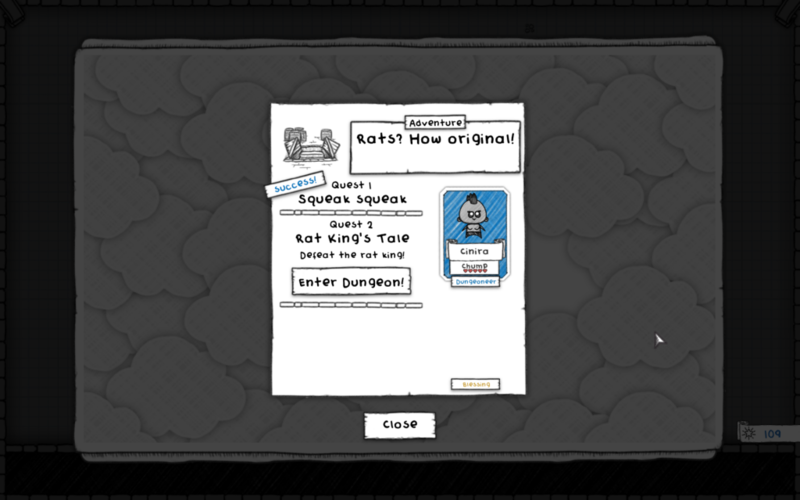 The dev team, glad not to be in the dungeon themselves! This is a pretty faithful port of the PC version of the game. As it's all turn based and using simple controls it's been quite straightforward to make work on a touch screen. The only fiddly bit has been keeping things legible on phones, which has meant a redesign of a few screens. We've got it running now on tablets AND phones, both iOS and Android. We aren't quite ready to announce our launch date but will do so quite soon. In the meantime, we're planning a closed beta test so if you want to help out please fill out your details over here. We haven't forgotten about Trophy Trial mode – that's just been put on the back burner temporarily while we finish up mobile edition. We'll get back to that once we launch on iOS and Android. We've also started work on a new expansion pack, similar in size to Pirate's Cove. More news on that soon! As always, a big thank you to everyone who's supported our game and made all of this possible! We're working on a new way to play Guild of Dungeoneering called Trophy Trial. It's a special highscore challenge mode, completely separate to the existing campaign, and it will be a free upgrade for everyone who owns the base game. Want to know more? Read on! Bonus: if you preordered the base game before launch on July 14th you should now have received this expansion for FREE. Check your Steam or GOG account! If you didn't then worry not you can pick it up on Steam or GOG now. 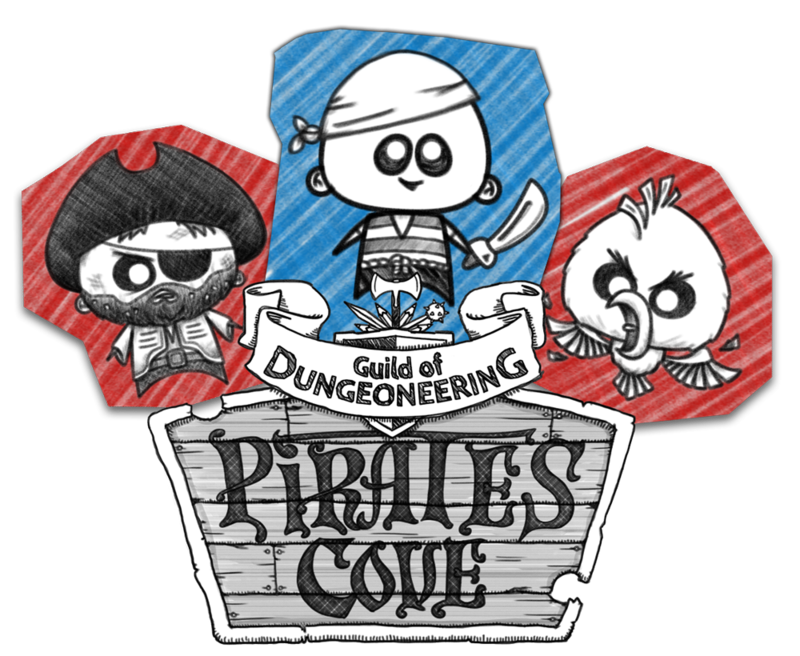 Guild of Dungeoneering: Pirate’s Cove is the first Adventure Pack we have created for Guild of Dungeoneering. What’s included? Battle 29 new monsters including Merfolk, Giant Crabs, Three-Headed Monkeys and of course more pirates than you shake a wooden leg at! This represents about one third more content compared to the base game. That's right! Get your dungeoneer on RIGHT NOW via Steam, GOG or Humble. There's also a press release here. We also have a wonderful new trailer for you to enjoy. And yes, that song IS in the soundtrack included in the Deluxe Edition. It's been an incredible two year journey putting the game together and I'm very proud of what we've built. I sincerely hope you all enjoy it! 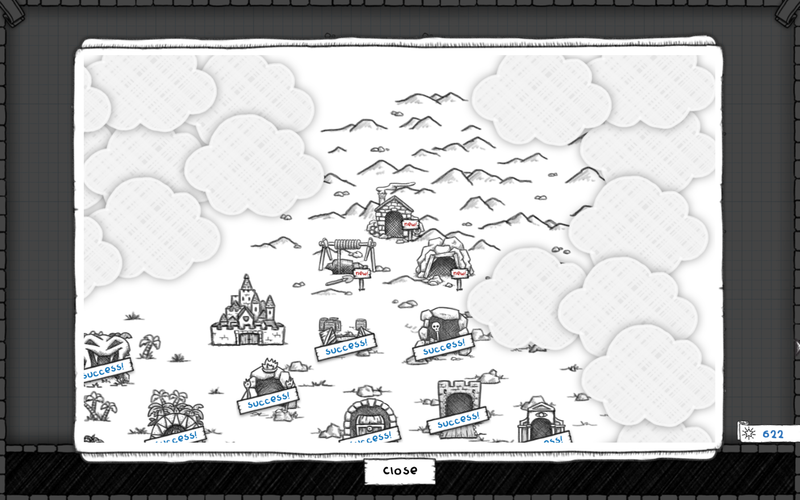 We're going to keep working on Guild of Dungeoneering. We have plans for new features, some DLC, ports, lots of things. I'll be sharing a roadmap of our goals very soon. We ran into a problem at the very last minute with our Mac build so unfortunately we've had to delay it. We're working on it right now and will have it up as soon as we possibly can. More info here. 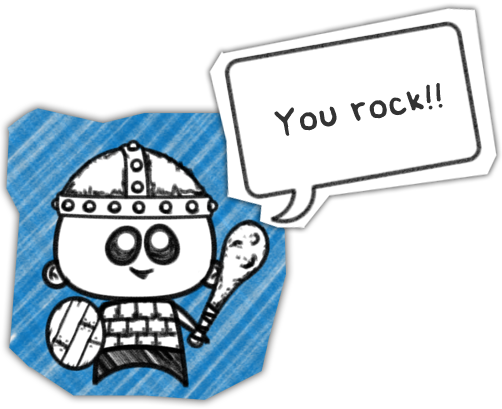 Today I want to talk a bit more about the thing you do the most in Guild of Dungeoneering: send out your expendable minions valued guild members on Quests! 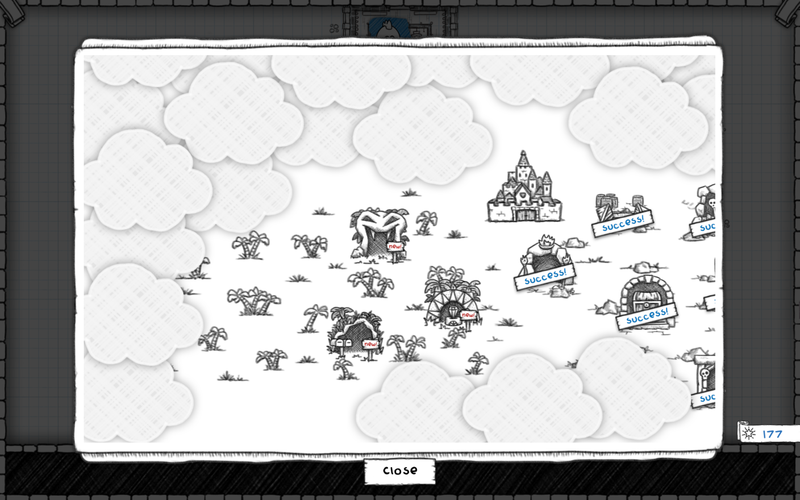 You start the game with a tiny guild and a single loyal follower, the Chump. 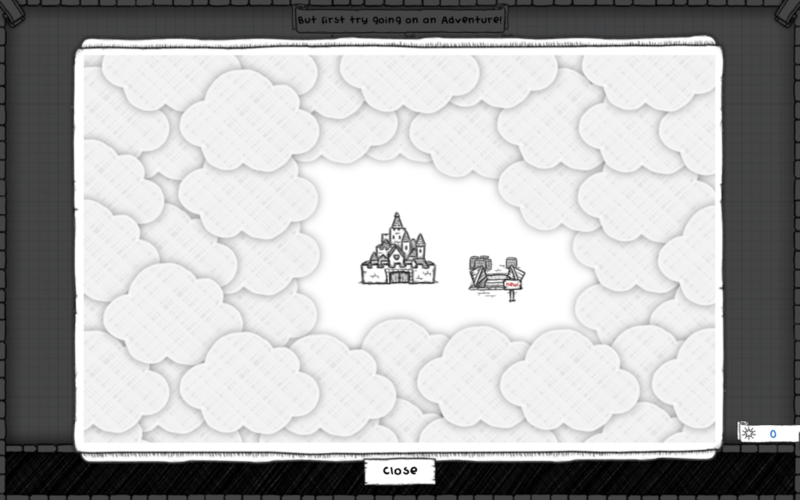 And there's just one Adventure available, which is a pretty easy one that acts as a nice introduction to the game. Adventures are places you can send your dungeoneers to try and tackle Quests. Most adventures feature a series of quests you need to tackle in order, though there are some that just have a single quest. The final quest in an adventure is always a boss battle. Here's what the world map looks like when you just have that introductory adventure to attempt. 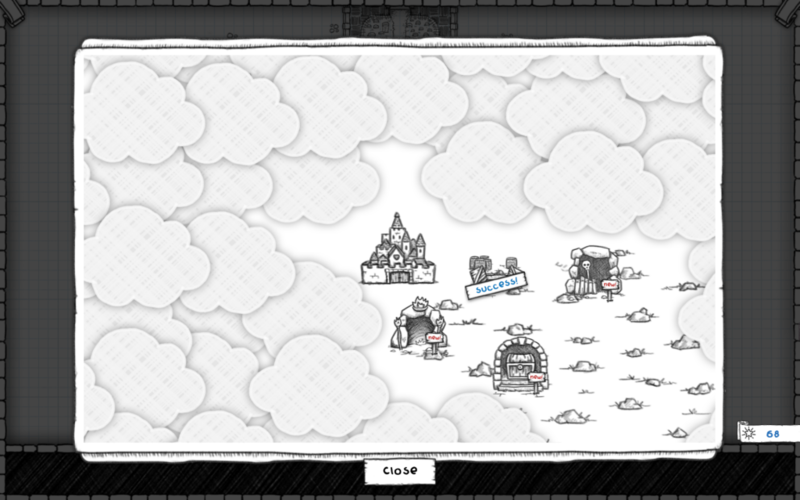 Cloudy with chance of tutorial. As soon as you beat this first adventure, taking down your first boss, you unlock three further adventures. So from now on you have a bit of choice about which ones you want to try next. And as you beat these ones, more unlock! OK that's more like it! Click on any adventure icon on the world map and you get to see the current quest for that location. Multi-part adventures should be revisited after each victory until you beat the boss and clear the adventure. Here's that starting adventure… of course since it's your first task we couldn't resist sending you off to deal with some rats! This is also where you select which of your dungeoneers to send on the quest, and of course where you pick a blessing. Blessings are part of the unlock system – make sure to unlock at least one early on. They give your dungeoneer a bonus for that particular quest run. Here's an example of a multipart adventure before you beat the first Quest and then just before taking on the final boss Quest. Embro! I remember him from the playable alpha! So How Do I Win Again? 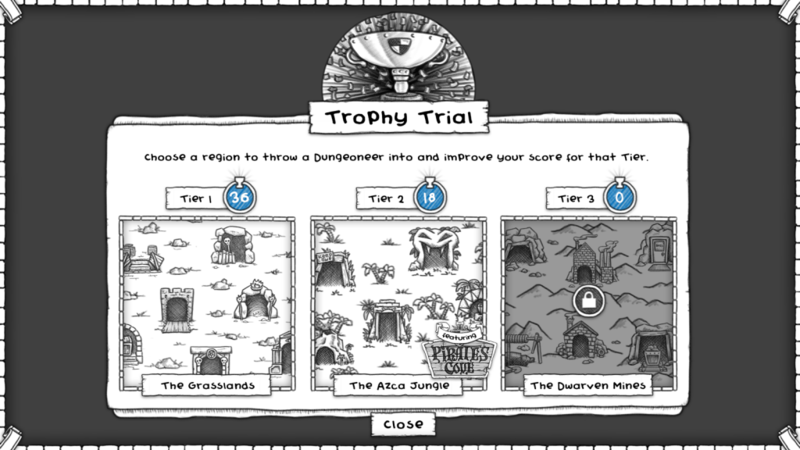 Within any particular quest you'll see your objectives at the top right. 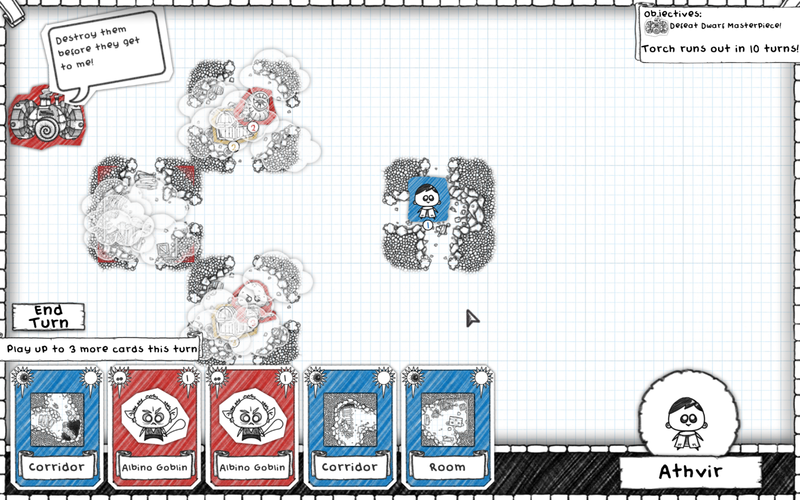 Sometimes they are simple, like this one where you just need to kill any three monsters (with some rats pre-provided). Sometimes they are a bit more involved. Here we need to steal the Orb of Nosiness, which is protected by that scary looking Eye Beast. And to make it worse we only have 8 turns before he turns us to stone! Just how nosy can you be without a nose? Each region has it's own unique tileset when you are questing there. Check out this sweet jungle action! Try and get them alone! Woah! A two-headed ettin, right behind you! 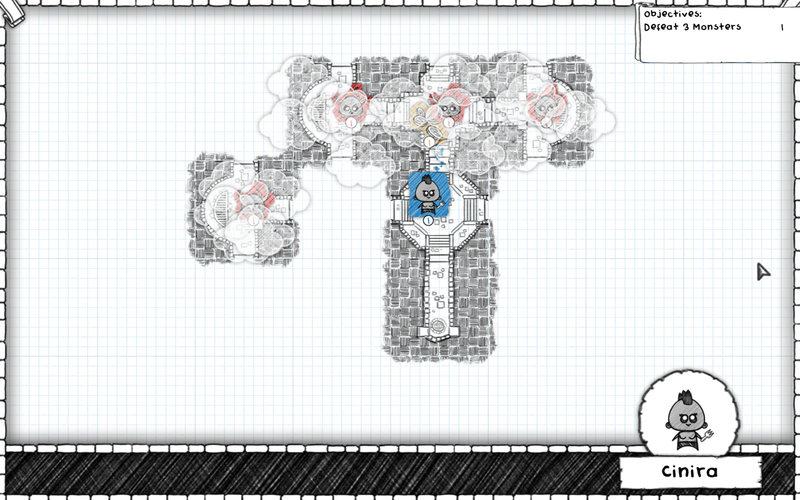 Our third region in the game is the Dwarven Mines, which is full of nasty contraptions. Doesn't look that masterful to me! And of course we have a finale adventure once you've battled your way through all three regions. I won't spoil it for you! 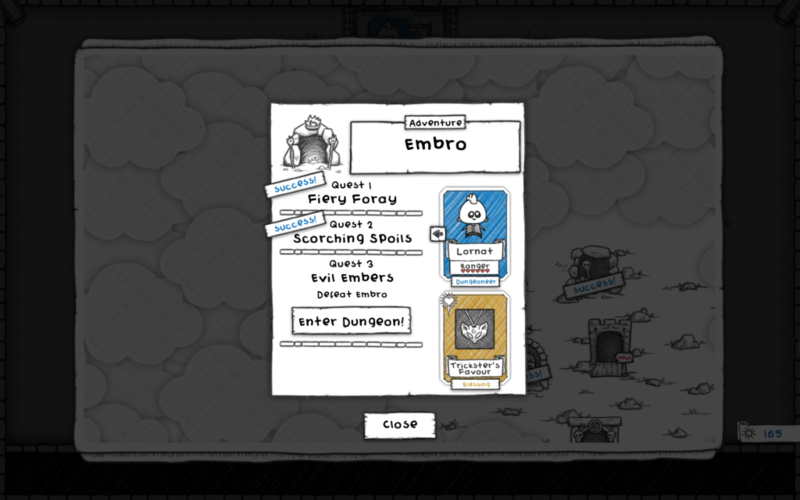 Following up from my last post which covered how you upgrade your Guild, today I'd like to talk a little bit about how classes work in Guild of Dungeoneering. Hero archetypes aka classes are as old as the hills. It's a concept that lets you say that this hero is good at healing and that one is better at smashing faces and basically everyone gets it straight away. 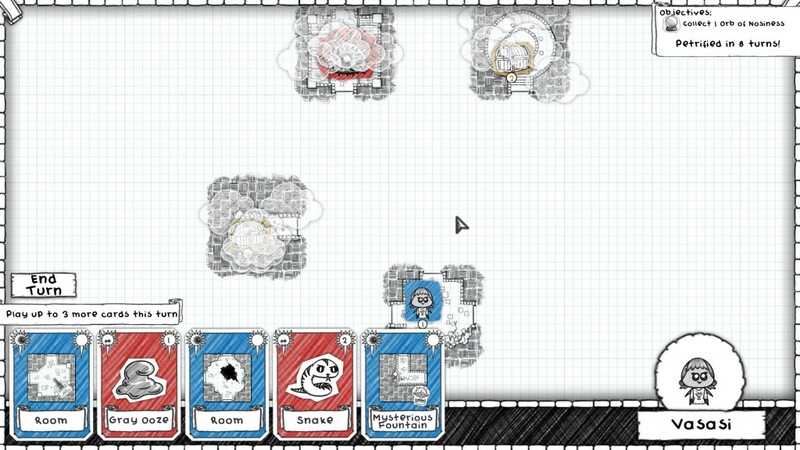 So naturally we're using classes in Guild of Dungeoneering! We do have a couple of twists. Firstly a lot of our classes don't sound like the regular fantasy RPG classes as we're willing to let a little humour invade this sometimes overly serious genre. Secondly since heroes always get reset (you can level-up in a single dungeon run, but once you are back in the guild it's back to their starting stats) we are using the unlocking of new classes as a replacement for how you might level-up a single hero in other games. Essentially your guild is the hero you are role-playing as in Guild of Dungeoneering, and thus that's what you level up and customise. But lets talk a bit about the actual hero classes you'll be filling your guild with. Lets start with the Chump which is the not-very-good dungeoneer you start out with. The Chump. Not the sharpest tool in the guild's toolbox. 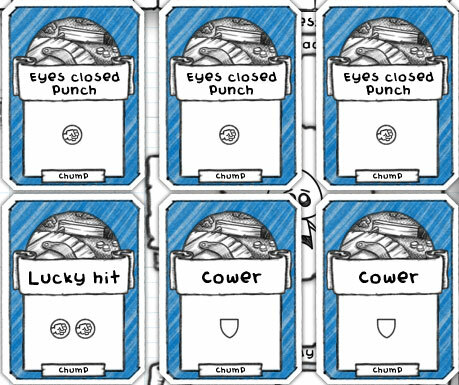 Every character class comes with six cards comprising their starting battle deck. These are the moves you'll be using in combat, and you are able to add to them by finding equipment on dungeon runs. But those starting six are very important. 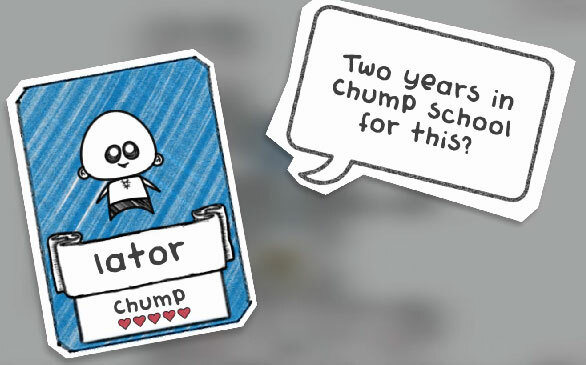 Unfortunately the Chump's battle deck is pretty lackluster. Keep your eyes open when you're punching! So that's three weak attacks (that's the icon for 1 physical damage), one ok attack and then two weak blocks. And to add to that Chumps have no special abilities. Better find them some sweet loot as soon as possible if you want to beat any bosses. On the plus side they are so awful that they make everyone else look pretty good! I hope you like cat puns. I meow I do! The Cat Burglar is one of four classes you can unlock quite early on in the game, what we call the Tier 1 classes (the chump is the only Tier 0 class). Each of the four has it's own special playstyle, strengths and weaknesses so you are very likely to find some of them are better for particular adventures. 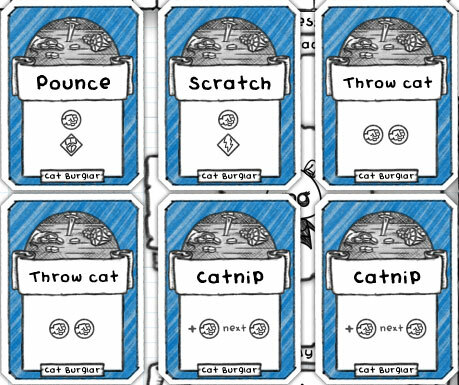 What does the Cat Burglar's combat deck look like? Who throws a cat? Honestly!? 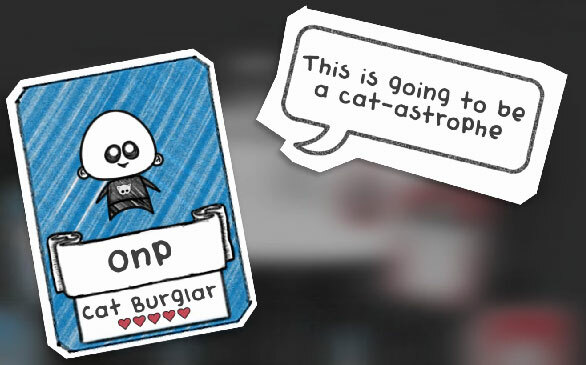 So the Cat Burglar is specialised around dealing out physical damage only, including an unblockable attack (pounce), a quick attack (scratch) and two self-buffs (catnip) which let you bide your time before striking even harder – ie when a monster's guard is down and they don't have a block ready. Their downside is that they have absolutely no blocking in their starting deck. Maybe something you could shore up with some equipment? Or you could push their specialty even more with some more quick attacks. The choice is yours! And they do have one starting trait called [Covetous] which gives them one additional choice of loot card after each battle – so you will be more likely to be able to specialise them in a given dungeon run. The Barbarian is one of our Tier 2 classes that becomes available a little further into the game. It sounds like a regular fantasy class but we've decided to make the ones that join YOUR guild really, really old. Well, beggars can't be choosers you know! So what's their battle deck look like? Remember: every time you play the howl card you should also howl in real life! 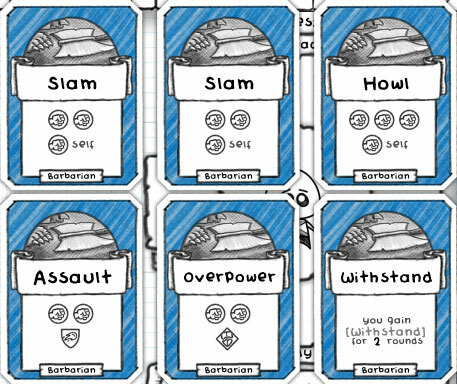 Ok, that's a LOT of damage output with 4 cards dealing two physical damage and one even doing three, though a lot of them come with a penalty where the barbarian also hurts themself. Withstand is a unique card which stops them dying for the next two rounds – very powerful! They also start with a special trait called [Deathwish] which gives them +2 health in any battle against a monster of higher level. Finally their AI is special in that they are drawn to attack monsters that are of higher level than themself (most dungeoneers try and avoid these monsters). These things all add up to a class that can take down monsters other classes wouldn't have a hope against early on in dungeon runs. 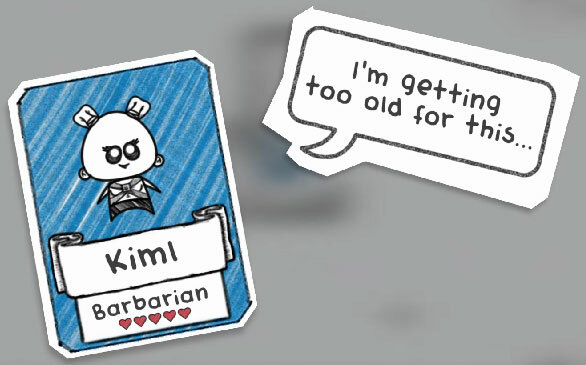 But do Barbarians have the late-dungeon staying power those other classes have? Well I guess you'll have to see! That's just a quick peek at three classes. There's 14 different ones in the game for you to enjoy! Join me next time when I talk about the Adventure & Quest system and the world map.